Wall scroll painted by Ma Lin in 1246. Ink on silk, 110.5 cm wide. Chinese painting is one of the oldest continuous artistic traditions in the world. The materials used in Chinese painting, brush and ink on paper and silk, have determined its character and development over thousands of years. Derived from calligraphy, it is essentially a linear art, employing brushwork to evoke images and feelings. Once on paper, brushstrokes cannot be erased or corrected, so a painter must have a complete mental concept of the painting before even lifting the brush. Chinese painting is closely related to Zen Buddhist and Daoist ideals of total concentration in the act of the very moment, and harmony between man and nature. The painter must work with speed, pitch, liveliness, confidence, and technical mastery, infusing spiritual energy into the brushstrokes. Chinese paintings do not attempt to capture the actual physical appearance of a subject, but rather its essential nature or character. Chinese paintings do not have a single perspective; every area of the painting is interesting to the eye. Landscapes are often painted from a viewpoint above the scene, so that many areas can be seen at once. In large scenes or landscapes, the eye is meant to travel along a visual path from one area to another. 2.1 Development to 221 B.C.E. There are three main subjects of Chinese painting: human figures, landscapes, and birds and flowers. Figure painting became highly developed during the Tang Dynasty, and landscape painting reached its height during the Song Dynasty. After Chinese painters were exposed to Western art during the nineteenth and twentieth centuries, they began to evolve new styles combining traditional Chinese painting with Western impressionism and perspective. The aesthetics of painting and calligraphy have significantly influenced the flowing lines and linear motifs that decorate Chinese ritual bronzes, Buddhist sculptures, lacquerware, porcelain, and cloisonné enamel. 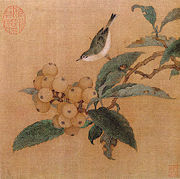 Loquats and a Mountain Bird, by an anonymous painter of the Southern Song Dynasty (1127–1279); small album leaf paintings like this were popular amongst the gentry and scholar-officials of the Southern Song. Traditional Chinese painting involves essentially the same techniques as calligraphy and is done with a brush dipped in black or colored ink, typically on paper or silk. The finished work is then mounted on scrolls, which can be hung or rolled up. Traditional painting also is done in albums and on walls, lacquerwork, and other media. Chinese painting and calligraphy are judged by the same criteria, the vitality and expressiveness of the brushstrokes and the harmony of the composition. Meticulous - Gong-bi (工筆), often referred to as "court-style" painting, or "fine-line" painting. This style of painting incorporates delicate Chinese calligraphy strokes and close attention to detail. Fine brushes are first used to create an outline of the subject, and then the artist goes back with softer brushes to apply layers of color washes until the desired effect is achieved. Freehand - Shui-mo (水墨) loosely termed “watercolor” or “brush” painting. The Chinese character "mo" means ink and "shui" means water. This style is also referred to as "xie yi" (寫意) or freehand style. This style emphasizes the interpretive aspect of brushwork and the shading of ink, and seeks to express the essence of the subject, rather than the details of its appearance. Only black ink and its shadings are used. Xie yi style has a freer, unrestrained look. The two styles are often combined in varying degrees. 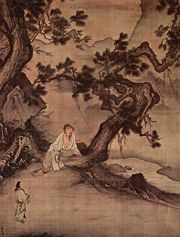 A third style, xi hua (西画) is a fusion of Chinese and Western painting techniques, incorporating elements of impressionism and Western perspective. The materials used in Chinese painting, brush and ink on paper and silk, have determined its character and development over thousands of years. It is essentially a linear art, employing brushwork to evoke images and feelings. The aesthetics of painting and calligraphy have significantly influenced the other arts in China. The flowing lines and linear motifs that decorate Chinese ritual bronzes, Buddhist sculptures, lacquer ware, porcelain, and cloisonné enamel are derived from the rhythmic brushstrokes of ink painting. Chinese paintings do not attempt to capture the actual physical appearance of a subject, but rather its essential character or quality. Landscape painters, for example, frequently go out and observe nature, then come back to a studio to paint what they have experienced. Many landscapes incorporate empty spaces to suggest light or clouds. A flower may be surrounded by blank paper, or paired with a bird or another flower that exists in a different season or climate. Certain details might be rendered with great care, to emphasize an aspect of the subject matter, while others are left to the imagination. Bold strokes contrast with soft, barely washed areas. Chinese paintings do not have a single perspective or view point; every area of the painting is interesting to the eye. Landscapes are often painted from a viewpoint above the scene, so that many areas can be seen at once. In large scenes or landscapes, the eye is meant to travel along a visual path from one area to another. Paintings on scrolls are made to be “read” from one end to the other, and the portions not being viewed can be rolled up. Chinese painters frequently copy the works of previous masters. Copying is regarded as a form of spiritual and artistic self-discipline, and accurate copies are admired almost as much as the originals. Many ancient paintings are no longer extant but have been preserved through copies that were made centuries later. Chinese painting is one of the oldest continuous artistic traditions in the world, originating around 4000 B.C.E. and developing over a period of more than six thousand years. In its seminal stages, Chinese painting was closely associated with other crafts such as pottery, jade carving, lacquer ware and bronze casting. The earliest paintings were ornamental, not representational, consisting of patterns or designs rather than pictures. Stone Age pottery was painted with spirals, zigzags, dots, or animals. During the Warring States Period (403-221 B.C.E. ), artists began to represent the world around them. Much of what we know of early Chinese figure painting comes from burial sites, where paintings were preserved on silk banners, lacquered objects, and tomb walls. Many early tomb paintings were meant to protect the dead or help their souls get to paradise. Others illustrated the teachings of the Chinese philosopher Confucius or showed scenes of daily life. The earliest surviving examples of Chinese painting are fragments of painting on silk, paintings on stone, and painted lacquer items dated to the Warring States period (481 - 221 B.C.E.). 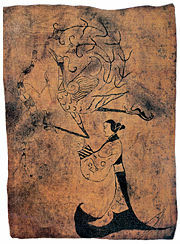 Painting from this era can be seen on an artistically elaborate lacquer coffin from the Baoshan Tomb (fourth century B.C.E.) 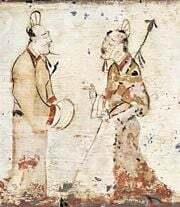 An early painting on silk from the Western Han Dynasty was found along with exquisitely decorated funerary items in a tomb at Mawangdui, Changsha, Hunan, China. An Eastern Han Dynasty lacquered wooden box with 3-inch tall painted figures, second century C.E. Beginning with the establishment of the Eastern Jin Dynasty]] (265–420), painting and calligraphy were highly appreciated arts in court circles and were produced almost exclusively by amateurs—aristocrats and scholar-officials—who had enough leisure time to perfect the technique and possessed the sensibility necessary for great brushwork. Calligraphy was regarded as the highest and purest form of painting. The implements used were the brush pen, made of animal hair, and black inks made from pine soot and animal glue. In ancient times, writing, as well as painting, was done on silk. After the invention of paper in the first century C.E., silk was gradually replaced by the cheaper new material. Original writings by famous calligraphers have been greatly valued throughout China's history and are mounted on scrolls and hung on walls in the same way that paintings are. Artists from the Han (202 B.C.E.) to the Tang (618-906) dynasties mainly painted the human figure. Paintings included images of immortals, emperors, court ladies, and common people at their work. After Buddhism was introduced to China during the 1st century C.E., the art of painting religious murals on the walls of grottoes and temples gradually gained in prominence. 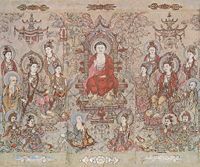 Some of the greatest treasures of Chinese painting are the frescoes found on the walls of the 468 Buddhist grottoes in Dunhuang in Gansu province. During the Six Dynasties period (220-589), people began to appreciate painting for its own beauty and to write about art. References to individual artists, such as Gu Kaizhi began to appear in written historical records, poetry and literature. Paintings illustrating Confucian moral themes, such as the proper behavior of a wife to her husband or of children to their parents, incorporated flowing lines and graceful figures. "In figure paintings the clothes and the appearances were not very important. The eyes were the spirit and the decisive factor." Copies exist of three silk handscroll paintings attributed to Gu, including Admonitions of the Instructress to the Palace Ladies (女使箴圖), an illustration of nine stories from a political satire about Empress Jia (賈后) written by Zhang Hua (張華 ca. 232-302). The Sakyamuni Buddha, by Zhang Shengwen, 1173-1176 C.E., Song Dynasty. "Spirit Resonance," or vitality, the overall energy of a work of art. According to Xie, if a painting did not posses Spirit Resonance, there was no need to look further. "Bone Method," or the way of using the brush. This refers not only to texture and brush stroke, but to the close link between handwriting and personality. At that time the art of calligraphy was inseparable from painting. "Correspondence to the Object," or the depiction of form, including shape and line. "Suitability to Type," the application of color, including layers, value and tone. "Division and Planning," placement and arrangement, corresponding to composition, space and depth. "Transmission by Copying," the copying of models, not only from life but also from the works of antiquity. Sun Wei was a noted painter in Sichuan area at the end of the Tang Dynasty. This piece, his only authentic work extant, depicts a well-known story, "Zhu Lin Qi Xian" (Seven hermits with superb talent enjoying their life in bamboo forest during the Weijin period [220~420 C.E.]). During the early Tang period, painting styles were mainly inherited from the previous Sui Dynasty. Figure painting, the "painting of people" (人物画) became highly developed during this period, especially in Buddhist painting and "court painting" depicting the Buddha, monks, nobles, and other famous figures. Brothers Yan Liben (阎立本) and Yan Lide (阎立德) were two major figures from this period. The works of Yan Liben, personal portraitist to the Emperor Taizong, which include Emperor Tang Taizong Meeting Tibetan Emissaries (太宗步辇图) and Emperors of Previous Dynasties (历代帝王图) are historically notable. Artists such as Zhou Fang illustrated the splendor of court life in paintings of emperors, palace ladies, and imperial horses. Figure painting reached the height of elegant realism in the art of the court of Southern Tang (937-975). Depictions of scenes and activities such as feasts, worship and street scenes provide a valuable historical record of the appearance, expressions, ideals, and religious beliefs of the people. Shan shui (山水, "mountain water") landscape painting developed quickly in this period and reached its first maturation. Li Sixun (李思训) and his son Li Zhaodao (李昭道) were the most famous painters in this domain. The great poet Wang Wei (王维) first created the brush and ink painting of shan-shui, literally "mountains and waters" (水墨山水画), and combined literature, especially poetry, with painting. These monochromatic and sparse landscapes (a style that is collectively called shuimohua) were not intended to reproduce exactly the appearance of nature (realism) but rather to grasp an emotion or atmosphere and capture the "rhythm" of nature. The theory of painting also developed, and themes from Buddhism, Daoism, and traditional literature were absorbed and combined into painting. Paintings on architectural structures, such as murals (壁画), ceiling paintings, cave paintings, and tomb paintings, became widespread. An example is the paintings in the Mogao Caves in Xinjiang. The use of line in painting became much more calligraphic than in the early period. Most of the Tang artists outlined figures with fine black lines and used brilliant color and elaborate detail. One Tang artist, however, the master Wu Daozi (吴道子, 680 - 740), who is referred to as the "Sage of Painting," used only black ink and freely-painted brushstrokes to create ink paintings that were so exciting that crowds gathered to watch him work. After Wu Daozi, ink paintings were no longer thought of as preliminary sketches or outlines to be filled in with color, but were valued as finished works of art. Wu's works include God Sending a Son (天王送子图), a depiction of the Heaven King holding his newborn son Sakyamuni to receive the worship of the immortals. Wu created a new technique of drawing named "Drawing of Water Shield" (莼菜描). A famous myth relates that the Emperor Xuanzong of Tang China commissioned Wu Daozi to paint a mural on the wall of the palace, depicting a nature scene set in a valley containing a stunning array of flora and fauna. Wu Daozi painted a door on the side of a mountain. According to the myth, the artist clapped his hands and entered the door, inviting the Emperor to come and see; sadly the door shut and he was lost forever. The "Four Generals of Zhongxing" painted by Liu Songnian during the Southern Song Dynasty. Yue Fei is the second person from the left. It is believed to be the "truest portrait of Yue in all extant materials." Buddhist Temple in the Mountains, eleventh century, ink on silk, Nelson-Atkins Museum of Art, Kansas City (Missouri). During the Song Dynasty (960-1279), landscapes of more subtle expression appeared; immeasurable distances were conveyed through the use of blurred outlines, mountain contours disappearing into the mist, and impressionistic treatment of natural phenomena. Emphasis was placed on the spiritual qualities of the painting and on the ability of the artist to reveal the inner harmony of man and nature, as perceived according to Daoist and Buddhist concepts. Figure painting was expanded during the Song Dynasty, to deal with subjects other than religious themes, such as historical events and stories of everyday life. Techniques of figure painting also became further refined. While many Chinese artists were attempting to represent three-dimensional objects and to master the illusion of space, another group of painters pursued very different goals. At the end of Northern Song period, the poet Su Shi (Simplified Chinese: 苏轼; Traditional Chinese: 蘇軾; pinyin: Sū Shì, Su Dongpo (蘇東坡), 1037–1101) and the scholar-officials in his circle became serious amateur painters and developed a new style of painting, using their skills in calligraphy to make ink paintings. From their time onward, many painters strove to freely express their feelings and to capture the inner spirit of their subject instead of describing its outward appearance. During the Southern Song period (1127-1279), court painters such as Ma Yuan and Xia Gui used strong black brushstrokes to sketch trees and rocks and pale washes to suggest misty space. Detail of the original Qingming Scroll by Zhang Zeduan, early twelfth century. Details of the painting "Along the River During Qingming Festival," the eighteenth century remake. One of the most famous artists of the period was Zhang Zeduan (Traditional Chinese: 張擇端; Simplified Chinese: 张择端; Hanyu Pinyin: Zhāng Zéduān; Wade-Giles: Chang Tse-tuan) (1085-1145 C.E. 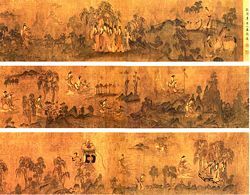 ), alias Zheng Dao, painter of Along the River During the Qingming Festival, a wide handscroll portraying life in a city. The original painting’s myriad depictions of people interacting with one another reveals the nuances of class structure and the hardships of urban life in China during the twelfth century. It also documents technologies, such as the designs of ships and passenger boats used in Song China. First piece of Dwelling in the Fuchun Mountains, by Huang Gongwang (1269 - 1354). He began serious studies in painting only at the age of 50. In 1347, he moved to the Fuchun Mountains (southwest of Hangzhou, along the northern bank of the Fuchun River), where he spent the last years of his life and made a number of paintings on the natural landscape. Six Gentlemen, by Ni Zan, 1345. During the Yuan Dynasty (1279-1368), painters combined the arts of painting, poetry, and calligraphy by inscribing poems on their paintings. These three arts worked together to express the artist’s feelings more completely than one art could do alone. It was not unusual for scholars to add their seals or writer comments on paintings or copies of paintings in their collections. A tradition of painting simple subjects—a branch with fruit, a few flowers, or one or two horses—began to develop during the thirteenth century. Narrative painting, with a wider color range and a much busier composition than Song paintings, was popular during the Ming period (1368-1644). Some of the greatest Chinese painters, including Zhao Menghu (Traditional Chinese: 趙孟頫; Simplified Chinese: 赵孟頫; Hanyu Pinyin: Zhào Mèngfǔ; Wade-Giles: Chao Meng-fu, 1254–1322) and Ni Zan (Ni Tsan,倪瓚 (1301-1374)), painted during this period. Zhao Menghu’s rejection of the refined, gentle brushwork of his era in favor of the cruder style of the eighth century is considered to have brought about a revolution that created the modern Chinese landscape painting. The subjects most widely painted by the Confucian literati were the so-called four virtues of bamboo (a symbol of uprightness, humility and unbending loyalty), plum (a symbol of purity and endurance), chrysanthemum (a symbol of vitality) and orchid (a symbol of purity), as well as bird and flower paintings. The first books illustrated with colored woodcut prints appeared around this time; as color-printing techniques were perfected, illustrated manuals on the art of painting were published. Jieziyuan Huazhuan (Manual of the Mustard Seed Garden), a five-volume work first published in 1679, has been in use as a technical textbook for artists and students ever since. Some painters of the Ming dynasty (1368-1644) continued the traditions of the Yuan scholar-painters. This group of painters, known as the Wu School, was led by the artist Shen Zhou. Another group of painters, known as the Zhe School, revived and transformed the styles of the Song court. Other famous painters of the Ming Dynasty include Dong Qiochang (T’ung Ch’i-Ch’ang), Huang Gongwang (Hunag Kung-wang), Wen Zhengming (Wang Cheng-ming). Shen Zhou (Chinese: 沈周; pinyin: Shěn Zhōu, 1427–1509), courtesy name Qinan (启南), was accomplished in history and the classics, and his paintings reveal a disciplined conformance to the styles of the Yuan Dynasty, to Chinese historical traditions, and to orthodox Confucianism. He is most famous for his landscape paintings and for his “boneless” renderings of flowers, meticulously created in the style of the Yuan masters. His inherited wealth afforded him the luxury of painting independently of patrons, and he did so in a way that, while revealing his historical influence, was uniquely his own. He frequently combined experimental elements with the more rigid styles of the Yuan masters. Much of his work was done in collaboration with others, combining painting, poetry, and calligraphy at gatherings with his literati friends. For painters of his Wu School, painting was a form of meditation, rather than an occupation. During the early Qing Dynasty (1644-1911), painters known as Individualists rebelled against many of the traditional rules of painting and found ways to express themselves more directly through free brushwork. In the 1700s and 1800s, great commercial cities such as Yangzhou and Shanghai became art centers where wealthy merchant-patrons encouraged artists to produce bold new works. Major painters of the Qing Dynasty include Wu Li, Gong Xian (Kung Hsien), Bada Shanten (Pa-ta Shan-jen; Ju Da or Chu Ta), Shitao (Shih-t’ao; Daoji or Tao-chi) and Wu Changshi (Wu Ch’ang-shih), and Ren Bonian (Jen Po-nien; Ren Yi or Jen I). After the bloody Taiping rebellion broke out in 1853, wealthy Chinese refugees flocked to Shanghai where they prospered by trading with British, American, and French merchants in the foreign concessions there. Their patronage encouraged artists to come to Shanghai, where they congregated in groups and art associations and developed a new Shanghai style of painting. One of the most influential painters of the Shanghai School (海上画派 Haishang Huapai or 海派 Haipai) was Ren Xiong, who died of tuberculosis in 1857 at the age of 34. Members of the Ren family and their students produced a number of innovations in painting between the 1860s and the 1890s, particularly in the traditional genres of figure painting and bird-and-flower painting. The new cultural environment, a rich combination of Western and Chinese lifestyles, traditional and modern, stimulated painters and presented them with new opportunities. The most well-known figures from this school are Ren Xiong (任熊), Ren Yi (任伯年, also known as Ren Bonian), Zhao Zhiqian (赵之谦), Wu Changshuo (吴昌硕), Sha Menghai (沙孟海, calligrapher), Pan Tianshou (潘天寿), Fu Baoshi (傅抱石). Other well-known painters are: Wang Zhen, XuGu, Zhang Xiong, Hu Yuan, and Yang Borun. Wú Chāngshuò (Wu Junqing (1844-1927)), a poet, calligrapher and carver of seals, later associated with the Shanghai school, helped to rejuvenate the art of painting flowers and birds. He considered carving seals and painting as integrated disciplines. His disciple, Wang Zhen (Chinese: 王震; Wade-Giles: Wang Chen (1867-1938)), a successful banker and a member of the Shanghai school, was a master calligrapher as well as a painter of flowers, birds, personages and Buddhist subjects. The works of both these painters enjoyed considerable popularity in Japan, where Wang is known as O Itei from his variant Chinese name of Wang Yiting (Wang I-t'ing). In the late 1800s and 1900s, Chinese painters were increasingly exposed to the Western art, and an artistic controversy arose over how to respond to it. Some artists who studied in Europe rejected Chinese painting; others tried to combine the best of both traditions. Perhaps the most beloved modern painter was Qi Baishi (Simplified Chinese: 齐白石; Traditional Chinese: 齊白石; pinyin: Qí Báishí, also Ch'i Pai-shih) (January 1, 1864 - September 16, 1957), who began life as a poor peasant and became a great master. His best known works depict flowers and small animals and he is known for the whimsical, often playful style of his watercolors. After the fall of the Qing Dynasty in 1911, as an extension of the New Culture Movement (1917 – 1923), Chinese artists started to adopt Western painting techniques, and oil painting was introduced to China. Some artists, including Zhang Daqian, Lin Fengmian, Pang Xunqin and Wu Zuoren, studied or worked abroad. Until 1843, Guangzhou (Canton) was the only legal port for trade between China and the outside world. This region, commonly referred to as Lingnan, produced some of the most important Chinese political thinkers of the late nineteenth and early twentieth centuries. Along with new political ideas, a distinct style of Cantonese painting began to evolve in the nineteenth century, and came into national prominence during the first part of the twentieth century. The leader of the Lingnan School of painting was Gao Jianfu (1879-1950?). After the overthrow of the Qing Dynasty in 1911, he and his followers, including his younger brother Gao Qifeng, promoted the development of a New National Painting (xin guohua), combining the local style with elements of Western and Japanese realist painting. Their intention was to create art that would be more accessible to ordinary citizens than the traditional literati painting of the past. As part of the effort to Westernize and modernize China during the first half of the twentieth century, art education in China's modern schools taught European artistic techniques, which educators considered necessary for engineering and science. Painting in the traditional medium of ink and color on paper came to be referred to as guohua (国画, meaning 'national' or 'native painting'), to distinguish it from Western-style oil painting, watercolor painting, or drawing. Various groups of traditionalist painters formed to defend and reform China's heritage, believing that innovation could be achieved within China's own cultural tradition. Some of them recognized similarities between Western modernism and the self-expressive and formalistic qualities of guohua, and turned to modernist oil painting. Others believed that the best qualities of Chinese civilization should never be abandoned, but did not agree on what those qualities were. One group of guohua painters, including Wu Changshi, Wang Zhen, Feng Zikai, Chen Hengke, and Fu Baoshi, were influenced by similar nationalistic trends in Japan and favored simple but bold imagery. Wu Hufan, He Tianjian, Chang Dai-chien and Zheng Yong, based their work upon a return to the highly refined classical techniques of the Song and Yuan periods. A third group, dominated by Xu Beihong, followed the footsteps of the Lingnan school in trying to reform Chinese ink painting by adding elements of Western realism. In the early years of the People's Republic of China, artists were encouraged to employ socialist realism and art became a vehicle for propaganda to educate the masses. Some socialist realism was imported from the Soviet Union without modification, and painters were assigned subjects and expected to mass-produce paintings. This regimen was considerably relaxed in 1953, and after the Hundred Flowers Campaign of 1956-57, traditional Chinese painting experienced a significant revival. Along with these developments in professional art circles, there was a proliferation of peasant art depicting everyday life in the rural areas on wall murals and in open-air painting exhibitions. During the Cultural Revolution (1966 – 1976), art schools were closed, and publication of art journals and major art exhibitions ceased. Many artists and intellectuals were exiled, lynched or imprisoned. Some traditional arts almost disappeared. As part of “the elimination of Four Olds campaign,” museums and temples were pillaged and art treasures were defaced and destroyed. Traditional landscape painting was proscribed by the Communist government because it was not considered to address social needs. Under difficult and dangerous circumstances, some Chinese artists continued to paint landscapes; liberated from traditional constraints and formulas, they took new directions. Brightly colored "peasant paintings," a form of Chinese folk art featuring traditional decorative elements borrowed from other crafts such as embroidery, batik and paper-cutting, are widely produced in rural areas. Xu Beihong (Traditional Chinese: 徐悲鴻; Simplified Chinese: 徐悲鸿; pinyin: Xú Bēihóng) was primarily known for his shuimohua (Chinese ink paintings) of horses and birds. He was one of the first Chinese artists to articulate the need for artistic expressions that reflected a new modern China at the beginning of the twentieth century, and one of the first to create monumental oil paintings with epic Chinese themes. He studied art in Tokyo in 1917, and at the École Nationale Supérieure des Beaux-Arts in Paris from 1919 to 1927. After the founding of the People's Republic of China in 1949, Xu became president of the Central Academy of Fine Arts and chairman of the Chinese Artists' Association. Xu is considered to be responsible for the direction taken by modern art in China. The policies enacted by Xu at the beginning of the Communist Era continue to define the Chinese government’s official policy towards the arts and the direction of the various art colleges and universities throughout China. Xu Beihong was a master of both oils and Chinese ink, but most of his works were in the Chinese traditional style. In his efforts to create a new form of national art, he combined Chinese brush and ink techniques with Western perspective and methods of composition. As an art teacher, he advocated the subordination of technique to artistic conception and emphasized the importance of the artist's experiences in life. Wash painting brushes are similar to the brushes used for calligraphy and are traditionally made from bamboo with goat, ox, horse, sheep, rabbit, marten, badger, deer, boar or wolf hair. The brush hairs are tapered to a fine point, a feature vital to the style of wash paintings. Different brushes have different qualities. A small wolf-hair brush that is tapered to a fine point can deliver an even thin line of ink (much like a pen). A large wool brush (one variation called the big cloud) can hold a large volume of water and ink. When the big cloud brush rains down upon the paper, it delivers a graded swath of ink encompassing myriad shades of gray to black. The strength and quality of the ink creates additional variations. Thick ink is deep and glossy when brushed onto paper or silk, while thin ink gives a lively, translucent effect. It is possible to convey light and darkness, texture, weight and coloring simply through the thickness of the ink. In addition, ink can be used dry or wet, pooled, splashed, splattered, clumped or dotted on the paper. Brush techniques include not only line drawing, but the use of stylized expressions of shade and texture (cunfa) and dotting techniques (dianfa) to differentiate trees and plants and also for simple embellishment. The charm of a brush-and-ink painting comes not only from the artist’s intentional self-expression, but from the interaction of the ink with the textured paper or cloth. In wash paintings, as in calligraphy, artists usually grind their own ink using an ink stick and a grinding stone but modern prepared inks are also available. Most ink sticks are made of densely packed charcoal ash from bamboo or pine soot combined with glue extracted from fish bone. An artist puts a few drops of water on an ink stone and grinds the ink stick in a circular motion until a smooth, black ink of the desired concentration is made. Prepared inks are usually of much lower quality. Ink sticks themselves are sometimes ornately decorated with landscapes or flowers in bas-relief and some are highlighted with gold. Chinese paintings were done on silk until the invention of paper around the first century C.E. This paper was made from a variety of materials including wood pulp, old fishing nets and bark. Modern Chinese paper, often known as rice paper in English, is often machine made. It is classified in degrees according to weight and the sizing used to make the paper. Rice paper is very absorbent, and the amount of sizing it contains dictates the quantity of ink used to make strokes on it. Some rough papers absorb ink quickly like a sponge; others have a smooth surface which resists ink. Silk must be treated with alum and glue before use, making it less absorbent than paper. Paper quickly came into favor with calligraphers and painters because it was available in a variety of textures and finishes, and because the brush strokes showed up more clearly on paper. Color inks are created by mixing water with ground mineral pigments. In Chinese painting, color is not used to show the effect of light on the subject, but to convey information about the subject. Adding traces of brown to rocks, leaves, and moss tells something about the season of the year or the weather conditions. In Chinese landscape painting (shan shui), colors represent the five elements that make up the universe, and the directions of the compass. Modern Chinese painters often mix several colors on a single brush, or mix their colors with black inks to obtained more natural and richly varied colors. Many critics consider landscape (shah shui) to be the highest form of Chinese painting. The time from the Five Dynasties period to the Northern Song period (907-1127) is known as the "Great age of Chinese landscape." In the north, artists such as Jing Hao, Fan Kuan, and Guo Xi painted pictures of towering mountains, using strong black lines, ink wash, and sharp, dotted brushstrokes to suggest rough stone. In the south, Dong Yuan, Ju Ran, and other artists painted the rolling hills and rivers of their native countryside in peaceful scenes done with softer, rubbed brushwork. These two kinds of scenes and techniques became the classical styles of Chinese landscape painting. Bird-and-flower painting (Traditional Chinese: 花鳥畫, Simplified Chinese: 花鸟画 huāniǎo-huà, Japanese: 花鳥画 kachō-ga, literally 'flower-bird painting') is a genre of Chinese painting devoted to depicting a wide range of natural subjects, including flowers (plants), fish, insects, birds, and pets (dogs, cats). Lin Liang (:zh:林良|林良), Qi Baishi (齐白石), and Zhang Daqian (张大千) are representatives of this genre. Flower painting derived from the Buddhist banner paintings, brightly decorated with flowers, which were brought into China from India when Buddhism was introduced in the 1st century C.E.. These paintings became popular during the Tang dynasty, and by the 10th century C.E., had become a distinct category of painting (huahua) using its own brush strokes and color wash techniques. Flower painting combined with the Chinese tradition of painting birds and animals. Many artists during the Song Dynasty worked in this genre, producing paintings of such things as plum blossoms, orchids, bamboo, chrysanthemums, pines and cypresses. Certain birds and flowers, such as plum blossoms and nightingales, were always paired. The strokes used to paint the stems of flowers or the beaks of birds were similar to brush strokes used in calligraphy. Bird-and-flower paintings were an expression of the Daoist ideal of harmony with nature. Once an artist mastered the brush techniques for a particular subject, he would gain the ability to express his own inner character and his relationship with nature through a few simple strokes. ↑ Styles of Chinese Painting Retrieved August 24, 2008. ↑ Asiaart.net. Chinese brush painting Retrieved August 24, 2008. ↑ National Gallery of Art Baoshan Tomb Retrieved August 24, 2008. ↑ China Heritage Quarterly 2 (June 2005), Book review of Excavation Report for the Mawangdui Tomb Australian National University. Retrieved August 24, 2008. ↑ Imperial Tours.net. The Principles of Chinese Painting Retrieved August 24, 2008. ↑ Shao Xiaoyi. Yue Fei's facelift sparks debate China Daily Retrieved August 24, 2008. ↑ Text by Dr. Julia Andrews and Kuiyi Shen, with 1998 update by Janice M. Glowski, Guggenheim Museum of Art: Exhibit of Modern Chinese Painting Ohio State University. retrieved August 23, 2008. ↑ Andrews and Shen, with 1998 update by Glowski, Guggenheim Museum of Art: Exhibit of Modern Chinese Painting Ohio State University. retrieved August 23, 2008. ↑ Singapore Art Museum (SAM) opens 'Xu Beihong in Nanyang' a Solo Exhibition.Art Knowledge News. Retrieved September 17, 2008. ↑ AsiaArt.net Chinese brush painting Retrieved August 24, 2008. Barnhart, Richard M. Three thousand years of Chinese painting. (The Culture & Civilization of China.) New Haven: Yale University Press, 1997. ISBN 0300070136. Cahill, James. Hills beyond a river: Chinese painting of the Yüan Dynasty, 1279-1368. New York: Weatherhill, 1976. ISBN 0834801205.
Cooper, Rhonda, and Jeffrey Cooper. Masterpieces of Chinese art. New York: Todtri, 1997. ISBN 0765191512. Fong, Wen. Beyond representation: Chinese painting and calligraphy, 8th-14th century. (Princeton monographs in art and archaeology, 48.) New York: Metropolitan Museum of Art, 1992. ISBN 0300057016. Morton, W. Scott, and Charlton M. Lewis. China: its history and culture. New York: McGraw-Hill, 2005. ISBN 0071412794. Needham, Joseph. Science and Civilization in China: Volume 4, Physics and Physical Technology, Part 3, "Civil Engineering and Nautics." Taipei: Caves Books Ltd., 1986. Volume 4. Perkins, Dorothy. Encyclopedia of China: the essential reference to China, its history and culture. New York: Facts on File, 1999. ISBN 0816026939. Sirén, Osvald. Chinese painting: leading masters and principles. (Seven vol. set) New York: Hacker Art Books, (original 1956) Facsimile Ed., 1975. ISBN 0878171304. Vainker, S. J. Chinese paintings in the Ashmolean Museum, Oxford. Oxford: Ashmolean Museum, 2000. ISBN 1854441329. This page was last modified on 15 February 2017, at 15:29.